Blair Lodge Guest House01271 882294work Guest HouseBlair Lodge Guest House occupies one of the best positions in Combe Martin. Combe Martin is a very picturesque, coastal village set in a beautiful narrow valley on the North Devon coast. 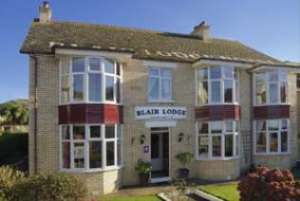 Approximately 100 yards from the sea and shops, Blair Lodge is ideal for those who wish to walk, being close to Exmoor National Park, or for those who wish to just relax and take things easy. Blair Lodge provides excellent homemade meals. #our menu changes daily and there is always at least one vegetarian and one fish option on for starter and main courses. Special diets can be catered for. Our dining room also has a bar with a comfortable lounge area. All of our double and twin bedrooms are en-suite whilst the single has private facilities with a bath and separate shower. To secure your booking a non-refundable deposit of £25pp is normally requested. You will be contacted by email after you have reserved a room(s). If you prefer a more personal touch when booking, or have any queries, you are very welcome to phone us on 01271 882294 or email info@blairlodge.org.uk. PLEASE NOTE that during high season, single night bookings in a sea view room may not always be possible. Thank you. Some special offers shown on our website cannot be booked online. Please phone 01271 882294 or e mail info@blairlodge.org.uk.